The OM-LGR-5320 Series are highspeed, standalone data loggers for analog and digital signals. Each module offers 16 analog inputs, 16 digital inputs, one single Form C relay (0.5A) digital output for triggering/alarming, and four counter/encoder inputs. These devices allow users to collect high-speed correlated analog and digital data without a computer. OM-LGR-5320 devices perform high-speed, correlated measurements, up to 200 kS/s, directly to a Secure Digital (SD) or SDHC memory card. Utilizing the advanced analog and digital triggering options, users can collect data to monitor systems and events without dedicating a PC. The OM-LGR-5320 loggers include easyto-use DAQLog software to configure the devices and retrieve data via the USB interface or SD memory card. Three models are available in the OM-LGR-5320 Series. The OM-LGR-5325 features up to ±10V analog inputs, 100 kS/s sampling, four conventional counter inputs (non-quadrature), and singlechannel trigger modes. The OM-LGR-5327 features up to ±30V analog inputs, 200 kS/s sampling, four quadrature encoder inputs, and multi-channel trigger modes. The OM-LGR-5329 includes all the functionality of the OM-LGR-5327 plus isolated digital inputs. 16SE/8DE analog inputs are included on each data logger. The OM-LGR-5325 features multiple analog input gain ranges up to ±10V. The OM-LGR-5327 and OM-LGR-5329 add a ±30V analog input range for increased measurement capability. Each data logger provides 16-bit resolution. The OM-LGR-5327 and OM-LGR-5329 can sample input data at up to 200 kS/s while the OM-LGR-5325 offers a 100 kS/s sample rate. Each module can sample all analog, digital, and counter data synchronously, making it easy to compare time between all channels. 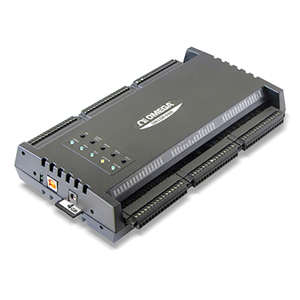 Each data logger can be configured through the SD memory card or via the on-board USB port. Simply configure the logging session with the included DAQLog software. All logging parameters are captured on the SD memory card. A 4 GB SD memory card is included with each data logger. Memory cards up to 32 GB are supported for extended data collection. Data is retrieved by removing the SD memory card from the logger and uploading to a PC or by connecting to the USB port on the logger. OM-LGR-5320 Series data loggers offer multiple triggering options for starting and stopping a data scan. These options vary by model. The OM-LGR-5325 features single-channel analog and digital triggering. The OM-LGR-5327 and OM-LGR-5329 offer multi-channel and pattern triggering options. Multiple trigger options allow collection of only the desired data. External clocking is also supported. 16 digital inputs are included with each data logger. These inputs can be sampled synchronously with analog input data. The OM-LGR-5325 and OM-LGR-5327 feature up to 28V digital inputs while the OM-LGR-5329 features up to 30V digital inputs. The digital inputs on the OM-LGR-5329 also provide 500 Vdc isolation. Each data logger also features one digital output relay channel. The Form C relay can be programmed via the included DAQLog software to alarm when desired conditions are met. Four counter inputs are built into the OM-LGR-5320 Series. The OM-LGR-5325 features conventional up/down counters. The OM-LGR-5327 and OM-LGR-5329 include quadrature and conventional counter inputs. Multiple count modes are also supported. LEDs on each module provide instant logging and trigger status and activity state. Data can be saved in .csv format for easy import into Excel®. (OM-LGR-5327, OM-LGR-5329): Level-sensitive based on acquired data. Up to 16-channels may be used as independent trigger sources. on the DIN0-DIN15 pins. Programmable mask bits. (-) inputs of differential receiver. Single-Ended: Phase A, Phase B and Index (+) inputs at user connector routed to (+) inputs of differential receiver. Phase A, Phase B and Index (-) inputs at user connector routed to ground. (-) Inputs of differential receiver routed to +3V reference. 참고: Comes complete with DAQLog software Quick Start Guide, 4 GB SD memory card, 2 m (6') USB cable, 100/240 Vac 0/60 Hz ac adaptor (USA plug), DAQLog software, and operator’s manual on CD.